Join us on this bus pilgrimage to visit St. Andre Bessette and the healing site of St. Joseph’s Oratory. Bus departures now available from both South Bend or Fort Wayne. Or, fly in and meet us in Canada! 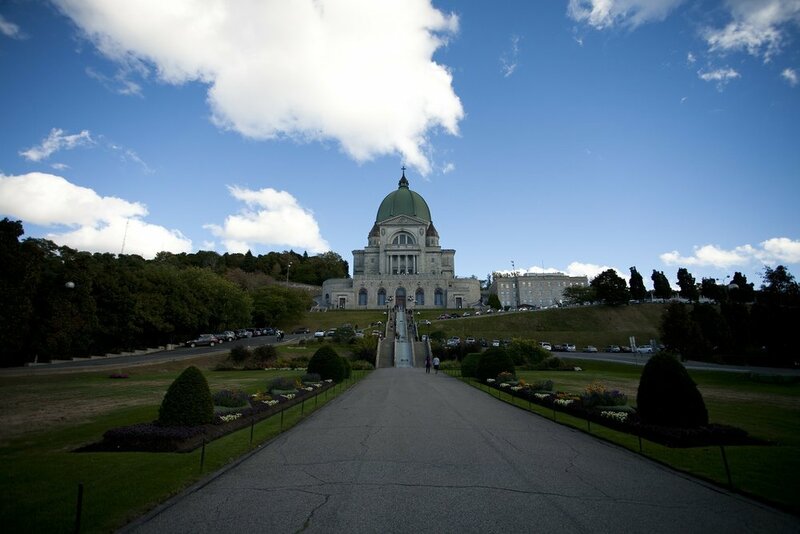 Pray for healing at St. Joseph’s Oratory - Miracles abound on the holy ground of St. Joseph’s Oratory in Montreal, where the “Miracle Man of Montreal” - St. Andre Bessette - lived and served for years. Thousands of pilgrims have come to ask for healing and many have been cured. Come discover the healing powers of God through the intercession of St. Andre and St. Joseph. Learn about the life of St. Andre and witness first-hand the places where he lived and ministered. Learn the rich history of the Church in Canada - Visit Notre-Dame-de-Bon-Secours Chapel, one of the oldest church in Montreal, spend time praying at Sainte-Anne-de-Beaupré in Quebec City, and kneel at the tomb of St. Kateri Tekakwitha. Experience the mission and spirituality of the Congregation of Holy Cross - Visit Holy Cross parishes in Toronto and the Oratory in Montreal. Be accompanied by Holy Cross religious who will offer insight about Holy Cross history and spirituality. Brother Carl Sternberg has been a Holy Cross Brother for over 50 years. He has a MA degree in theology from Notre Dame and a MA in applied spirituality from the University of San Francisco. He has taught at all levels including being an adjunct faculty member for their masters in ministry program at Loyola University in New Orleans. Brother Carl’s main ministry over the last 25 years has been establishing and developing the Midwest Holy Cross Associates. Having attributed his healing with a transplanted kidney to Saint Brother Andre, he is very excited to be part of this pilgrimage to Brother Andre’s shrine and much more. Rev. David J. Scheidler, C.S.C., graduated from Notre Dame with a Bachelor of Arts degree with double-majors in History and Communications & Theater. After working a year in Manhattan for Lord & Taylor, he entered Moreau Seminary, receiving his Master of Divinity in 1993 and Ordination to the priesthood in 1994. In 1995 he served as rector of St. Edward’s Hall, and he was also the associate rector of the Basilica of the Sacred Heart and assisted in Campus ministry with various programs, including the Freshman Retreat and Spanish Mass. From 2003-2007 he was assigned to Notre Dame College Preparatory in Niles, Illinois, where he was the Director of Campus Ministry and a religion teacher. Next he was the associate pastor on the parish team of St. Adalbert and St. Casimir in South Bend. From 2010 to 2013 he served in Monterrey, Mexico, in various capacities. Before being assigned as the pastor of Sacred Heart Parish in Notre Dame, Indiana, he served as the Associate Rector of the Basilica again from 2013-2017, and helped with other projects in Campus Ministry. Day 1: Saturday, July 13 (D) - Depart from South Bend or Fort Wayne to Toronto. Visit Holy Cross parishes for Mass, dinner, and introductions. Check into hotel and overnight in Toronto. Day 2: Sunday, July 14 (B) - Drive to Montreal. On the way, stop at the Shrine of St. Kateri Tekakwitha for a tour and Mass. Then visit St. Andre Bessette’s Baptismal Church before checking into the hotel and dinner. Overnight in Montreal. Day 3: Monday, July 15 (B, D) - Morning pilgrimage to local Montreal parishes: Mary, Queen of the World Cathedral, Basilica of St. Patrick’s, and Notre-Dame Basilica. Free time in the Old City Montreal before dinner at a local restaurant. Overnight in Montreal. Day 4: Tuesday, July 16 (B, D) - Full day at St. Joseph’s Oratory to discover the life and ministry of St. Andre Bessette. Pray the beautiful Outdoor Stations of the Cross and experience a Healing Prayer Service in the early afternoon. Dinner followed by overnight in Montreal. Day 5: Wednesday, July 17 (B, D) - Depart for a day-trip up to Quebec City, including the Cathedral-Basilica of Notre-Dame de Québec and Sainte-Anne-de-Beaupré. Return to Montreal for overnight in Montreal. Day 6: Thursday, July 18 (B, D) - Morning free time before departing for Niagara Falls. Check into hotel and dinner. Overnight in Niagara Falls. Day 7: Friday, July 19 (B) - Morning boat ride up to Niagara Falls (bring a poncho if you want to stand outside!). Depart for South Bend or Fort Wayne and arrive home in the evening. Please note: Itinerary is tentative and subject to change at any time. (B,L,D) denotes meals (Breakfast, Lunch, Dinner) which are included in the pilgrimage package. Canada-only pilgrims should meet the group at the Montreal hotel at the end of Day 2 and can depart anytime on Day 6. Canada-only package does not include airfare or airport transfers. Please note: Quoted rates may fluctuate based on accommodation selection and availability. Quoted prices are based on the current exchange rate of 1 US Dollar to 1.3 Canadian Dollar. Final price may fluctuate based on final exchange rates when travel vendors finalize payments (typically between 30-90 days prior to departure). Rates also assume a minimum of 25 full-paying pilgrims. Invoices will be emailed in February for the final balance. The final balance is payable by credit card, debit card, check, money order, or electronic bank transfer. If you select the "Pay balance by check" savings during registration, then the final balance will only be payable by check, money order, or electronic bank transfer. Checks and money orders can be made payable to "Verso Ministries LLC".